At the invitation of Bulgarian Prime Minister Boyko Borissov and German Chancellor Angela Merkel, Premier of the State Council Li Keqiang will travel to Bulgaria for an official visit and the Seventh Summit of Heads of Government of China and Central and Eastern European Countries in Sofia and then travel to Germany for the fifth round of China-Germany inter-governmental consultation and an official visit from July 5 to 10. At 10:00 a.m. tomorrow morning, the Foreign Ministry will hold a briefing here for Chinese and foreign press on Premier Li Keqiang's travel. We welcome your participation. Q: The 15th Senior Officials' Meeting on the Implementation of the DOC has concluded. What specific outcomes have been reached during the meeting? We know that some countries outside this region are worrying about navigation freedom in the South China Sea. What is your take on the current situation there? 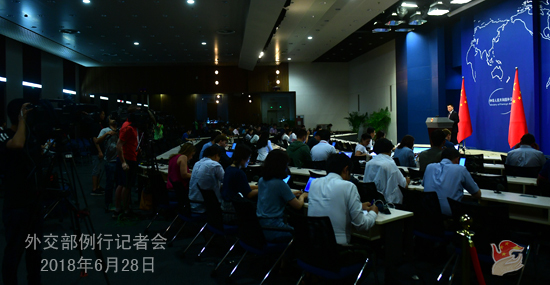 A: Senior officials from China and the ASEAN countries held the 15th Senior Officials' Meeting on the Implementation of the DOC and the 24th Joint Working Group Meeting on the Implementation of the DOC in Changsha, China's Hunan Province from June 25 to 27. Vice Foreign Minister Kong Xuanyou led a delegation to the meeting as China's Senior Official. All participants had an in-depth and thorough exchange of views on the implementation of the DOC and advancement of practical maritime cooperation and consultations on the COC. All parties acknowledged the sound and stable situation that the South China Sea is enjoying at the moment, reaffirmed the importance of the comprehensive and effective implementation of the DOC, and agreed to move ahead the COC consultations based on the already established COC framework so as to produce a unified draft document at an early date which will act as the basis for next-stage talks. At the meeting, officials also updated the DOC implementation plan for 2016-2018. 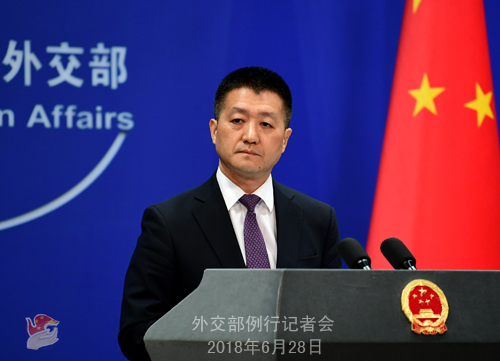 All participants agreed that we will peacefully resolve the South China Sea disputes through negotiations, control differences within the framework set out by regional rules, enhance mutual trust and prevent unexpected incidents on the sea through cooperation, and jointly maintain peace and stability in the South China Sea. We are pleased with these positive outcomes which all stand as testament to the regional countries' commitment to cherishing the current good atmosphere for peace, stability, cooperation and development. China and other regional countries have more reasons than any non-regional parties to hold dear peace and navigation freedom and security in the South China Sea, considering our own interests. Some external forces have been trying whatever they can to muddy the waters in the South China Sea, including through hyping up the non-existent proposition that navigation freedom and security is somewhat affected. To these attempts, regional countries are on necessary and high alert. We hope that countries outside this region could respect the collective efforts made by regional countries to preserve regional peace and stability and promote regional cooperation, development and prosperity. They should refrain from stirring up trouble out of nothing. Q: According to reports, Russian President Vladimir Putin met with the visiting US National Security Adviser John Bolton on June 27. Putin said that Russia-US relations were not in the best shape, something he put down to domestic political tussling in the United States. Bolton said President Trump believed the contact between the US and Russia was good for both countries and stability in the world. In addition, Russia and the US are set to announce on June 28 the time and location for their summit. Do you have any comment on Russia-US relations? What is China's expectation for this summit? A: We have noted the relevant information released by the Russian side on Ambassador Bolton's visit. Russia and the US are both permanent members of the United Nations Security Council and countries with major influence on international affairs, thus assuming great responsibilities for world peace and security. We welcome the improvement of relations and strengthening of communication and dialogue between Russia and the US, because they are surely conducive to the cause of world peace and development and to the joint efforts of the international community to address global challenges. Q: It is reported that China has rejected the request from the United States to discuss China's position on the listing of Taiwan on airline websites. Why was the request for meeting rejected? A: The Civil Aviation Administration of China has made clear China's position on this issue. We have also repeated our position many times. There is only one China in the world, and Taiwan is an inalienable part of China's territory. It is a fact acknowledged by the international community, and it is also common sense. The one-China principle is a must-have foundation for any development of relations and cooperation between China and the rest of the world. 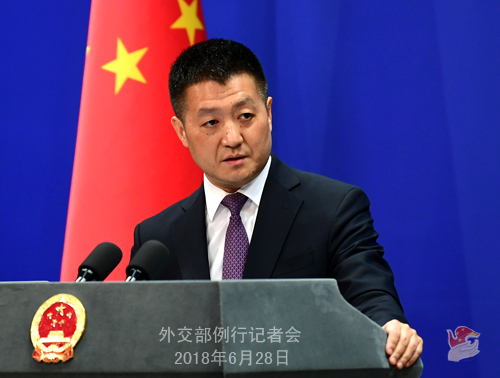 Respecting China's sovereignty and territorial integrity and observing China's laws is a fundamental principle that foreign enterprises operating in China must follow. On this issue, China's position is clear-cut, firm and consistent. Q: According to reports, South Sudan's President Salva Kiir and the opposition signed a peace agreement on June 27 which will enable a ceasefire to take effect within 72 hours. The parties will continue to discuss such issues as the arrangement of ceasefire and power sharing. What is China's comment on that? A: President Salva Kiir and the opposition leader Riek Machar signed a peace deal in Khartoum, marking an important step in South Sudan's peace process. This is also an outcome of the long-term and tireless mediation efforts by the international community, especially regional countries and organizations. China welcomes this development. The Chinese side hopes that all conflicting parties in South Sudan could faithfully implement the relevant peace agreement to realize ceasefire and cessation of violence, come to agreement on pending issues as soon as possible, and restore peace and stability in South Sudan at an early date. Q: US President Donald Trump said yesterday that he will be expanding the national security reviews on foreign investment to try to prevent acquisition of sensitive technologies from the United States. There has been discussion on whether or not this is targeting China among US officials. Does China have any response? A: I took a similar question yesterday. The Spokesperson of China's Commerce Ministry also responded to similar questions this morning. Like I said yesterday, we will continue to watch what the US government chooses to do with regard to foreign investment, including the recent legislation or other methods by the US Congress on trade and investment. We will continue to monitor how its actions may affect the trade and investment relations worldwide, especially between the major economies, and its possible influence on the global macro-economy. The Spokesperson of China's Commerce Ministry also said that we will monitor the US policies' potential impacts on Chinese enterprises. We have been reiterating that under the current circumstance, all countries should strive to further facilitate and liberalize trade and investment, instead of trying to impede normal trade and investment flows by the convenient excuse of national security. Q: Can you confirm that there was a request from the US side to discuss the issue of listing Taiwan as part of China? A: The US government and companies know very well the Chinese government's position on the Taiwan issue. Our position has never changed and remains consistent and clear.